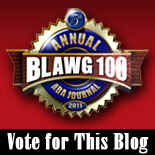 Wow, this blog is one of the ABA Journal’s 100 law blogs (or “blawgs”) on the 2011 ABA Journal Blawg 100! Thanks very much to the ABA Journal for the nod! As in years past, they’re taking votes for best blog in a number of categories. If you’d like, you can vote for this blog here, or by clicking the big shiny picture to the left. Unsurprisingly, you will find this blog nominated in the “Criminal Justice” category.